Mega Moolah, a Microgaming progressive slot that has been around from 2008, challenges players to win one of four progressive jackpots. Mega Moolah is a progressive slot with four progressive jackpots, 5 reels, and 25 paylines. Although packed with exciting special features, the slot is incredibly easy to play. Players need to first place a bet, spin the reels, and collect payouts if a winning combination of icons is created. The slot has an affordable coin value range of $0.01 to $0.05, and players are allowed to bet up to 125 coins per game. The max bet for this slot is therefore $6.25, which is definitely not much considering the fact that it can transform players into millionaires. 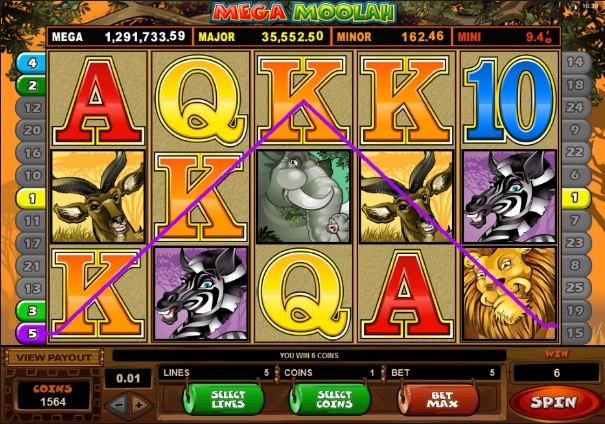 Mega Moolah is based on the theme of an African safari. The reels are packed with icons of wild creatures such as giraffes, lions, elephants, and monkeys. A few high-value card icons can also be seen. The game features astounding graphics that are brilliant and crystal clear. The sounds effects are excellent, but players can turn them off if they wish. Mega Moolah has some fun features that make it worth playing. The first is the QuickSpin feature, which players can use to spin the reels faster. This enables players to play more games in a shorter period of time. The slot also has an Autoplay feature, which players can use to spin the reels automatically while they sit back and relax or do something else. The most exciting feature of Mega Moolah is its four-tiered progressive jackpot. The tier 1 jackpot has a seed value of $10 and is won the most. The tier 2 jackpot has a seed value of $100, the tier 3 jackpot has a seed value of $10,000, and the tier 4 jackpot has a seed value of $1 million. If players get really lucky, they can become millionaires while playing this delightful slot. The progressive jackpot game gets activated at random, and in order to win one of the progressive jackpots, players have to play this game and win. Mega Moolah features a wild multiplier symbol, a scatter symbol, and a free spins round, which players can use to win big money. The Monkey symbol serves as the scatter, which means that combinations of Monkey symbols do not have to appear along an active payline to fetch payouts. If players spin a combination of at least three Monkey symbols anywhere on the reels, the free spins bonus round gets activated. As soon as players activate the free spins round, they will receive 15 free spins. The free spins round can be re-activated while playing a free game. Players can play Mega Moolah at any Microgaming online casino.